Pilot an egg shaped tank in a vertical scrolling shoot-em-up. Fire missiles and bombs at insect-like enemies, shoot ground and flying targets. Reasonable vertical scrolling shoot-em-up, pilot your tank up the screen destroying the enemy on the ground, in the air or popping up from under the sea. You can turn and fire in any direction. 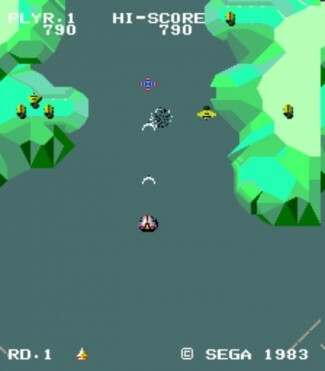 The bomb is similar to Xevious where a target ahead of the ship shows where the bomb will explode. There are a variety of different landscapes including a maze section you must navigate. The enemies also have an insect-like look about them. Music is a little cheesy and graphics are fairly small, but effective. Good for it’s age and very hard.